Sharpen you AWeber Axe. Abe Lincoln is quoted as saying ““Give me six hours to chop down a tree and I will spend the first four sharpening the axe.” If you are using Aweber and WordPress then it is in your best interest to know what your options are. Then you can pick the best features to add to your blog. Here are some cool things about AWeber and WordPress that you may not know. Each of the them can help you get more opt ins or improve your email marketing! AWeber has been around for over ten years and like all companies that last that long there are nooks and crannies that not even they remember exist. There is also the issue of changes that were made to the AWeber Web Site in June of 2013. There are lots of tutorials and blog posts out there that show menu options that no longer exist. The features are all still there – somewhere. When WordPress bloggers think of Sign Up Forms they usually think of Squeeze pages and Sidebar widgets. The more advanced think of Pop-overs or Slide-ins (not pop-ups anymore, all the browsers block those). In fact there are many more places (see my blog post 11 Places to Collect Subscribers). 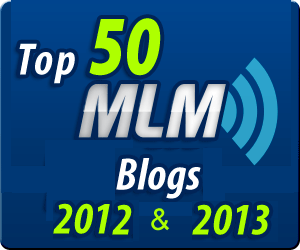 One of the most effective places is on your blog page. People are reading your content and if they like it, they want to make sure they don’t miss any of your material. This is a great time to have them sign up. There are six different areas you can use to collect subscriber names. The ones most bloggers are most used to are the various kinds of sidebar/header/bottom widgets offered by most themes. In addition, AWeber has or supports plugins for five different areas. I called them high, middle, low, Pop-over and Checkbox. Most of the plugins I will show you were created by AWeber, but not all. Viperbar is an AWeber and WordPress plugin that over 5,000 blogs are using. The developers claim that it is highly effective. They also note that they are not actively developing it at this time due to other commitments. This was not created by AWeber. You can tailor the look and feel of the bar to match your blog’s color scheme and your fonts. It is very easy for readers to find. Viperbar works with AWeber, Mailchimp and FeedBurner (which is going away). You can install this by going to Add New Plugins and searching the WordPress library for Viperbar. You can either put a simple Sign Up Form right in your content in the text area of your post (e.g. At the bottom of each post). You simply change the edit screen to Text instead of Visual and paste the AWeber Sign Up HTML into your post. The AWeber and WordPress Footer Slideup plugin, creates a bar at the very bottom of your blog page. This bar slides up and can be dismissed by your reader. When we think of AWeber and WordPress and Sign Up Forms (we used to call them Web Forms), we usually think of what AWeber calls inline forms. These either go on a sales page or in a text widget in the sidebar of your blog. What were called pop-ups are the domain of purchased plugins and pricy special WordPress themes. I say these places to subscribe your Leads “were called pop-ups” because almost all the browsers now block pop-ups (which open in a new window). 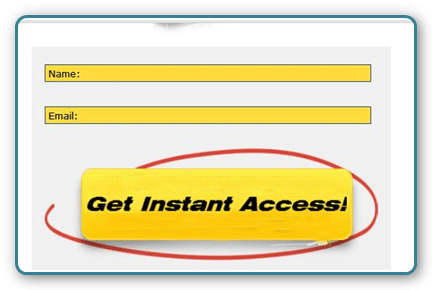 The browsers do not block what are called slide-in or pop-overs and so the folks who create forms that appear on top of your page are still in business. As much as these annoy us, study after study shows that they increase sign ups on blog pages by more than 20% and sometimes MUCH higher. Well AWeber does have pop-overs (and a pop-up which they recommend you do NOT use). 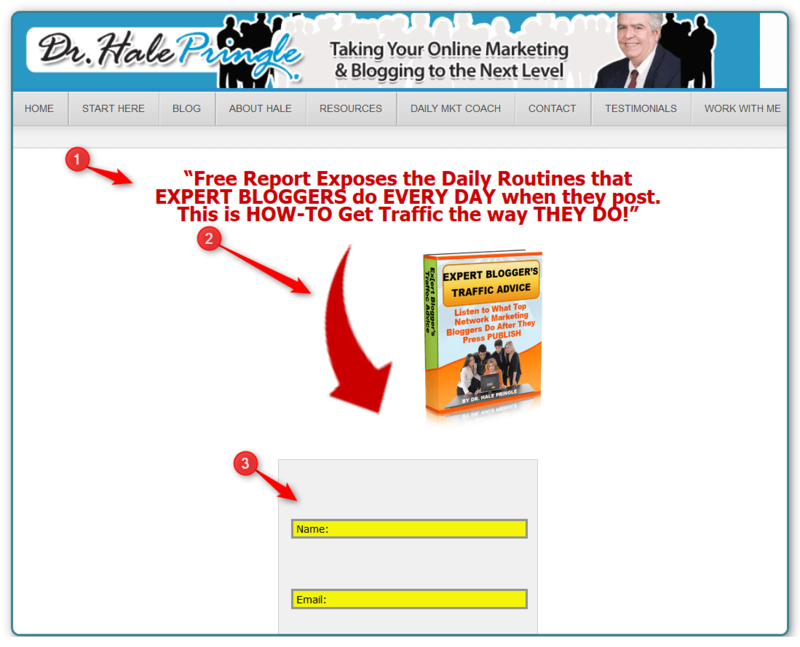 Pop-Over – this is a small screen that appears “over” your blog post. You encourage readers to sign up and receive a free gift. Lightbox – this is the same as the Pop-Over, it just darkens the rest of the screen while it is active. 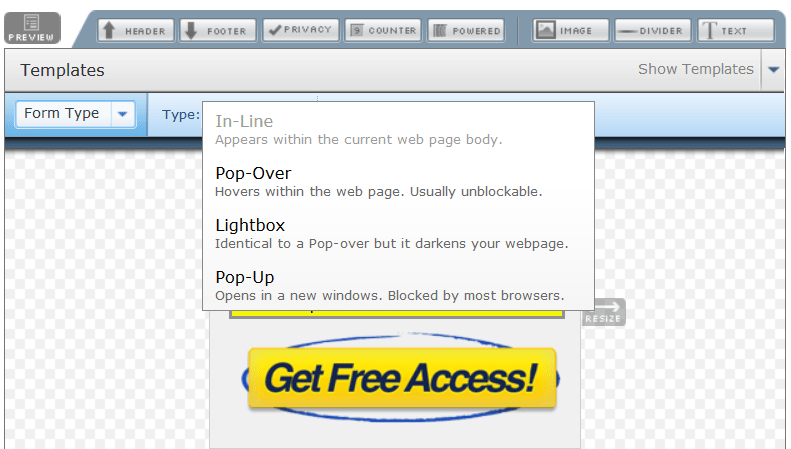 Pop-up – similar to the Pop-over, but will be blocked by most browsers. I recommend the Pop-Over called Pippity, but if you are on a budget, AWeber’s LightBox form does work. Even though we just covered four areas where readers can subscribe to your list on your blog page, there another. AWeber’s Web Form Plugin has a couple of features, but the one people seem to use is an option to place a single line with a check box after the comment section in your blog. If someone comments AND checks the box, they will be automatically added to one of your AWeber lists. Very easy and very cool. The reader has already entered their name and email address so the check mark is all they need to subscribe to your list. Note that you can customize what the text says as I have done here. Many AWeber and WordPress bloggers use the Gravity Forms plugin. The base price is $39 and creating Contact Me or Special Data Entry Forms just doesn’t get any easier. What isn’t usually seen is that there are two more advanced versions of Gravity forms. 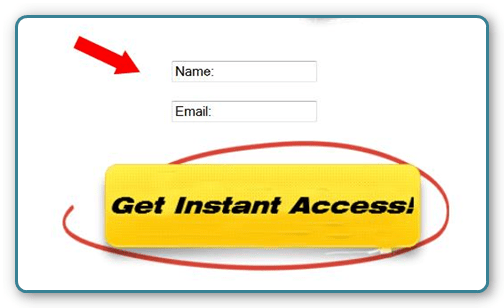 The $99 Business Version allows you to subscribe people who fill in one of your forms. They currently work with AWeber and Mailchimp. The advanced version ($199) allows you to create polls and quizzed and connects to things like PayPal. While it seems that most people do not use AWeber’s Sign Up forms right out of the box, some do. If you do they allow you to create multiple Sign Up forms and tell AWeber that your want them to randomly present the forms and collect data on opt ins. Note: The AWeber video shows a button below the “Sign Up Forms” list. It has been moved to the drop down inside the green “Create a Sign Up Form” button (#1). You can see the “Split Test Your Sign Up Forms” option there (#2). You must have two forms to split test (#3). There is a simple form where you tell AWeber what percent of the time you want each form to appear. With two forms, I can’t think of a reason that you wouldn’t always choose 50/50. You will be able to easily see the number of times each form is displayed and how many times each is clicked. NOTE: Best Practice tells us to change one thing on the form at a time. If you change the color, add and image and change the headline all at the same time you will 1) have no idea what caused any changes you see and 2) won’t know if one of you changes made the form more attractive while another made it less attractive. The two effects might cancel each other out. 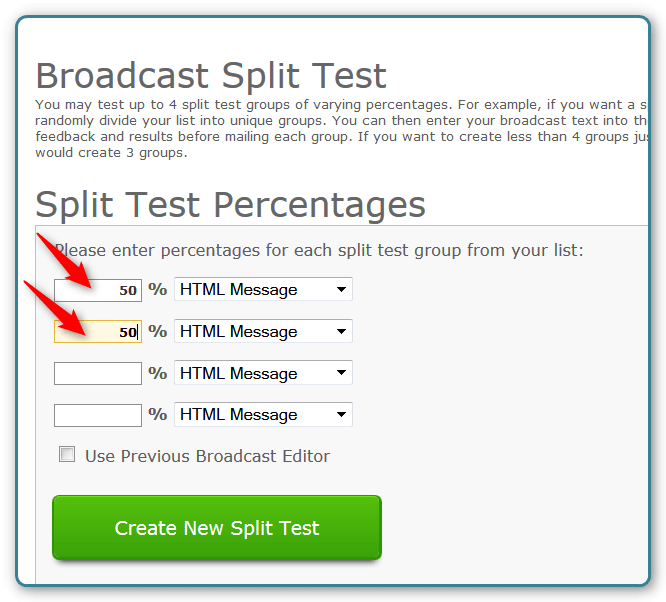 In addition to creating a split test on your Sign Up Forms, AWeber can also run a split test on your broadcast emails. 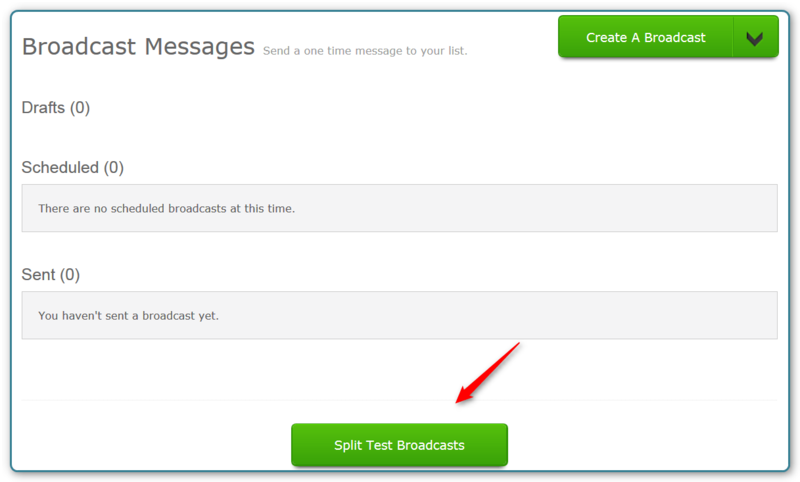 Creating a split test broadcast message is very easy. Note: You cannot send to several lists at one time with the split testing option. If you want to run a split test on your largest list and send one of the messages to the some of your other lists, they is a warning you should know. When you send a message to several lists, all at one time (using the check boxes under the Publish steps) AWeber automatically removes duplicates so each person only gets one email. If you send your split test to one list and one of the options to other lists then people who are one more than one of your lists will get two or more copies of your broadcast email. Enter percentages to show how many versions you want in your split test. The percentages must total 100%. AWeber creates two or more draft Broadcast emails. Edit them – again note – only make one difference between your emails. You can see that two draft messages were created. Edit the messages – be sure that you only change ONE thing, such as the headline. 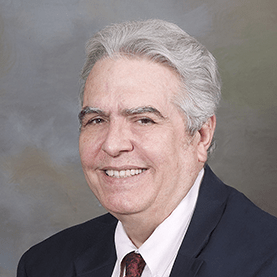 Here are two things AWeber warns us about – they are worth Noting! Split Test Broadcasts only work within the list you create them in. So don’t use the Send to Multiple Lists feature while split testing. Also, note that you cannot send to a segment while split testing a message – split tests are sent to randomly selected potions of your entire list. One of the issues that comes up when AWeber and WordPress users create Squeeze Pages or Widgets using AWeber forms is that there is a lot of white space in the form. Since you want your form to be “Above the Fold” (readers do not have to scroll down to see important information or to sign in), every line counts. #3 – Getting rid of the lines between the Name field and the Email field. I use the plugin TinyMCE Advanced. The plugin changes the editor in WordPress. Among other things it lets me choose a font (Tahoma) and a size (6 or 7). Note that I left the page title blank. This gets rid of the large black title with a vertical black bar beside it. There are some things that the WordPress editors just don’t like to center. I can often get multiple images to play nice by marking their position as “none” in WordPress when I insert them and then dragging them. I also often resort to using PowerPoint to create a slide with the image (and sometimes text) that looks just right. Then I set the background to transparent (Right click and click on Set Background). Then I Save As and choose PNG. It will ask if I want one slide or the whole presentation. Then I insert that single image. When AWeber won’t center things, I have to go into the text version of the editor (sometimes this is called “source.” I add this line before the section I want centered. after the section I want centered. Note: an old trick that still works is to put something you can easily find into the screen before you go to the text version of the editor. For example you could put xxxxxxxxxxxxxxx at the top of what you want centered and zzzzzzzzzzzzzzzzzz at the bottom. Those two strings are easy to spot inside all the gobbledygook HTML code. Once you are back to the visual editor, you take the xxxxxxxxxxxxxxxxxx and zzzzzzzzzzzzzzzzz out. This is sometimes more difficult than it should be. I have fiddled with the AWeber Sign Up form to put the “Name:” and “Email:” inside the text fields. This saves two lines since the default on most of their forms puts the word “Name” and the word “Email” on it’s own line. That takes up two lines. I also modified the text fields so that they have a yellow background unless they are being edited and a grey background while they are being edited. The last change to was to a Cool Button. I covered that in another blog post. Once you have the HTML code to paste into your Blog Page, click on the Text version of the editor and paste the code into the page. Next you click on the VISUAL Tab to move back to the visual editor. There are spaces between the lines. Click on Save Draft That takes care of putting the color into the text fields. Now we need to delete the extra lines. Click just to the right of the Name Field. 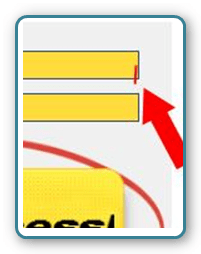 The cursor will look like it is inside the text box. Press Shift-Enter and then delete until the lines close together. Do the same things at the end of the email field to move the button up.Note: Without the Shift-Enter this doesn’t’ work. That should take care of the blank lines. AWeber and WordPress users can activate tracking where AWeber will keep counts for you. If you put a link in your email to one of your pages, you can see which users actually clicked on the link and if they then purchased something on the page. In order to do this, you must activate the Advanced Email Analytics. Installing this plugin is the usual 1) Go to Plugins 2) Click on Add New, 3) search for AWeber Analytics, 4) Install and 5) Activate. Ah, but the second feature is important. You enter a simple code and AWeber Email Analytics is activated on each page of your blog. After you have installed the plugin (This is a standard install, just search the WordPress library for it), you click on the Setting link. Put the code after “id=” into the AWeber Integration Settings page shown above. If you have enough people subscribed and following you blog post, you can use this as Social Proof. When readers are deciding if they should subscribe and follow your posts, they like to see that others are following you. AWeber has a plugin that will put the subscriber count where you want it. Install the plugin by normal method of going to Plugin –> Add New and search the WordPress library for AWeber Subscriber Count. 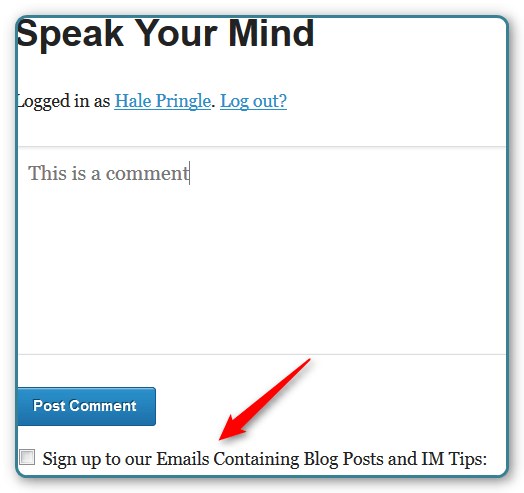 Once you have installed it, you will be given “shortcodes” that you can place in your blog or widgets. The shortcode will return the number of subscribers to the list(s) you indicate. These would be the lists you usually send an email notifying them that you have written a new blog post (or that are on your “automatically send Blog Post Broadcasts too – see below). Most marketers seem to prefer to manually send their blog posts to their subscribers. This allows them to create some “teaser” information that makes the blog post look appealing and then they give a link to the blog post. 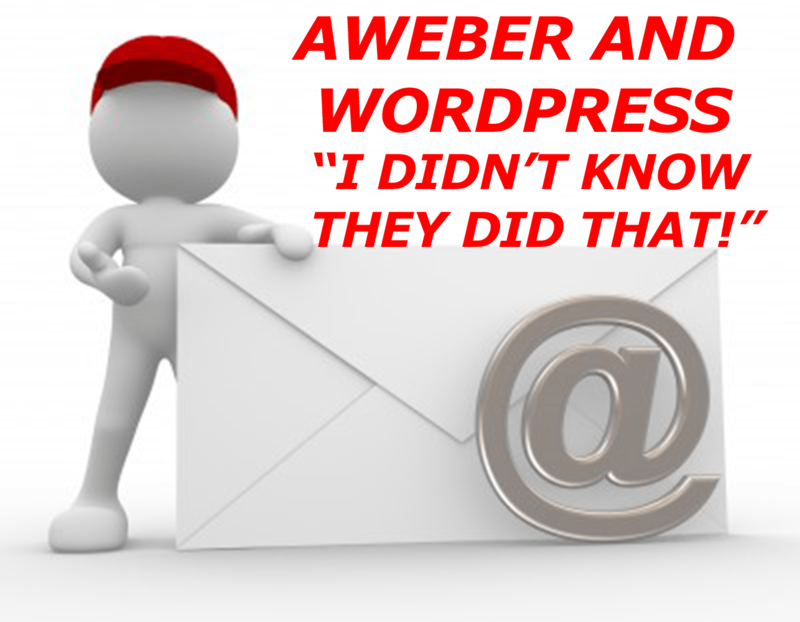 AWeber does provide a way to automatically send your blog posts as Email messages. AWeber collects the RSS feed from your blog, creates and automatically creates an email. There are several options at that point. You can send it immediately or you can have it queued to send. 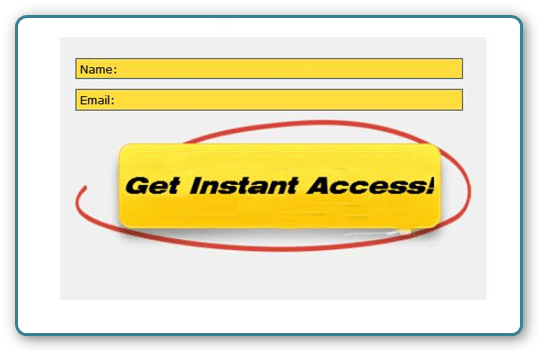 If you use this option you manually check the email and then send it when you are ready. Here is a video from AWeber that shows the process.